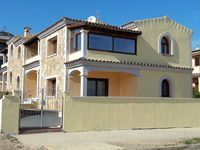 Properties in San Teodoro Port average 4.5 out of 5 stars. wonderful, unforgettable view / OFFER 9-16 JUNE !! Property 4: wonderful, unforgettable view / OFFER 9-16 JUNE !! A few steps from the sea ..
Property 33: A few steps from the sea .. Enjoy your holiday in Sardinia 100 meters from the beach! Property 48: Enjoy your holiday in Sardinia 100 meters from the beach! Fantastic apartment in a beautiful little town. The apartment is modern, very clean and well equipped. We enjoyed our stay very much. I would highly recommend it. Clean, modern apartment, with a pool. Great space for a family of four or six. Located just a few miles from beautiful beaches. The host was very responsive and friendly. I can certainly recommend this place.